Tune: "Did You Think to Pray?" Je-sus came un-to the ci-ty. They said,"Je-sus now is com-ing"
And the way was clear. Please have mer-cy up-on me." To do for you? That's the ques-tion." "Go', said Je-sus, "Your faith healed you." Then the man re-ceived his sight. Print lyrics "Did You Think to Pray?" Hear the tune "Did You Think to Pray?" by William O. Perkins. Watch as the blind man sees again. 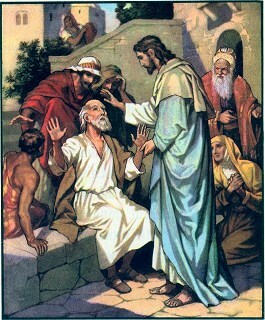 Press "Go" to search for books about Jesus and the Blind Man.